Sometimes you just have to pick it up. It might be the vibrant colour, the shape, or the intricacy of the work that attracts the eye. It was the latter factor that made me pick up a piece of Chessell pottery a few weeks ago as I wandered around an antiques centre in South Wales, the day before I was due to film at an Antiques Roadshow. The pale, feminine colours and the beautiful, carefully sculpted leaves that lay inside the bowl caught my eye, suggesting a delicate moment of nature caught in time. At a mere £4, I could hardly leave this handmade work of ceramic art behind, so it came with me, carefully wrapped for the journey. 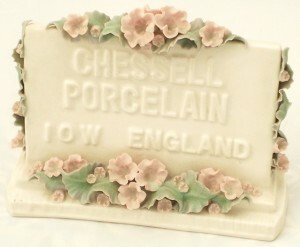 The Chessell Pottery was founded in 1978 by Sheila and John Francis in the pretty village of Chessell on the Isle of Wight. John and Sheila had met in 1960 while studying ceramics at the Royal College of Art, and they married two years later. In 1963, they were offered work in their beloved field of ceramics in Africa, where they lived until 1977. During their time and travels there, they developed pottery departments at various educational institutions, held exhibitions of their own work, and even met famed studio potter Michael Cardew. 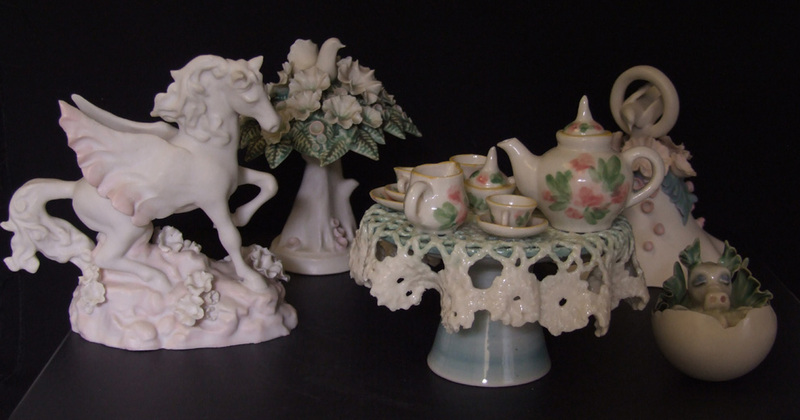 Pictured left: A selection of Chessell Pottery including Winged Horse and Dragon. Sold for £102.00 on ebay.co.uk, Sep 2013. On their return to the UK, they realised their long-held dream of owning a studio pottery of their own by purchasing and renovating a barn near Yarmouth. With over fourteen years of experience, they set about producing innovative designs that were decorative, quite unlike the majority of studio pottery, which was primarily functional home and tablewares. Sheila was the driving force behind the balanced and tranquil designs, which were sketched out on paper by hand, and focused on the ‘water garden’. This theme took form in shallow bowls filled with foliage and flowers that recall lush forest pools, fungus and coral gardens. West African botany was an enormous influence on their designs. Bodies were thrown on a wheel or cast using liquid ‘slip’ clay, and embellished with handmodelled leaves, flowers and other motifs. Yes – these parts were handmade. That means that each and every piece is entirely unique in terms of the composition and the parts used to make it. Frilled, scalloped edges are typical and, if you look very closely, you can often see the fingerprints of the potter on some of the leaves or flowers – a direct link with an object’s creation that is a joy to discover. On a hallmark creamy base, colours were primarily delicate greens, blues, yellows and pinks, but also included browns and blues. Their pale tones were created by staining, rather than glazing, the clay. Pieces were then dipped in, or sprayed with, a satin, semi-matte glaze before being fired at a high temperature. Early pieces were made using a fine stoneware, which was replaced by 1981 with the creamy porcelain that characterises their work. Although many sales in the early years were made to tourists visiting the island, John and Sheila were also canny business people, realising that to be successful, they had to find business and develop it. As such, they marketed and promoted their wares at a number of trade shows, including the notable Spring and Autumn gift fairs at the NEC in Birmingham, and at Frankfurt in Germany. In addition to being stocked by major British retailers such as Harrods and Liberty, their designs were soon exported across the world, including to Japan, the US and South Africa. Americans were particularly captivated, more so after 1985 when John and Sheila visited Busch Gardens in Florida to demonstrate how pieces were made. New designs were added throughout the 1980s, which was very much the golden age of the pottery. By 1987, 39 products were available, and the pottery employed a staff of ten. A commemorative ‘Decade’ range was introduced a year later to celebrate the 10th anniversary of the pottery. I’m particularly fond of the delicacy of the ‘Ice Maiden’ range, with its simple, modern cylindrical forms bearing moulded flowers and leaves in an abstract pattern. Placing a tea-light inside transforms these pieces, as the different thicknesses of porcelain are brought to life in rich, warm tones that give depth and perspective to the pattern. These can be found for anything from £10-80, depending on size. Birds were already a popular motif, with cats coming a year later in 1989, and dinosaurs in 1992. The recession meant that the 1990s were not as easy for the pottery, but the popular dragon range (introduced in 1990) helped keep their business stable into the new millennium. Numbers of visitors to the pottery surged towards the end of the 1990s, over-taking their all-important sales via gift fairs to retailers. By their 20th anniversary in 1998, 43,000 people visited the pottery, making up over 80% of sales. With their dream realised, John and Sheila took the decision to retire in 2001, and sold the pottery the following year. Sadly, John died in 2003, but Sheila still lives on the island that brought them both success and so much joy. The founding of the Chessell Pottery collectors club in 1990 crystallised collectors’ interest in John and Sheila’s designs, and special pieces were produced for members. Although sadly no longer in existence, us collectors tend to be a consistent lot, and interest is still strong – growing even. Ann Wheeler, whose husband Ron acted as an agent for the pottery, told me “I first fell in love with the delightful feminine designs and intricate hand-formed floral applications of Chessell porcelain when Ron began working with them in the 1980s. Unfortunately I wasn’t able to afford much of it then, but I am now making up for lost time now and indulging myself whenever I get the opportunity”. That just about sums it up. Although it is instantly recognisable, Chessell is also usually marked. Early pieces from before 1981 bear a printed ‘cp’ monogram, which was impressed into the body after this year. Paper labels also date from the early 1980s onwards. The one tip I would give you is to make sure the fragile porcelain isn’t damaged, as this reduces values quite considerably. My small ‘Water Lily Garden’ bowl has one chip on the rim, so is probably worth only a bit more than I paid, and that’s mainly due to the large size, as it’s also a common design. Cleaning is best done carefully with a soft brush and warm soapy water. Regular readers of my column will have noticed that I haven’t given too much information about prices so far. There’s a reason for this – as the market is still young, prices are still variable and depend on where a piece is being sold. Nearly all pieces can be found for under £100 right now, with only the largest and most complex, and rarest, pieces fetching more. These were also very expensive at the time. 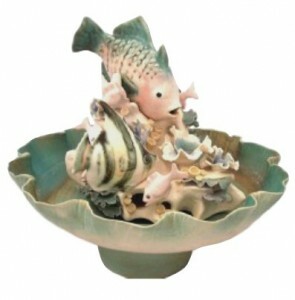 The rare and large ‘Coral Reef Fish’ fountain shown here is a good example, fetching around £300. Compare that to the small and common bowl also shown here, which is typical of souvenirs bought in their thousands. Still, a good and representative collection of these fantastically frilled, foliate and floral fancies can be built up by spending under £50 per piece, often far less. However that may change in time. In my job, a lot of people ask me what is going to be a ‘collectable of the future’. Although it is very much still early days, I feel sure that Chessell will be one of them. With thanks to, and images courtesy of, Ron & Ann Wheeler of Artius Glass, www.artiusglass.co.uk. Find out more… ‘A Century of Ceramics: A Selection of 20th Century Potters & Potteries in the Isle of Wight’, by Lisa & Andrew Dowden and Robin Goodredge, published by Dowden & Goodredge, 2005. Artius Glass, specialist dealers in Chessell Pottery, Isle of Wight Studio Glass, and more, www.artiusglass.co.uk. Find out more about Mark and his finds by reading his blog at www.markhill.net.